There is very little doubt that garlic and its somewhat less pungent cousins are the best examples of foods with the most significant medicinal value. Their relatively high sulfur content is the foundation for many of the molecules that help us detoxify our blood, that reduce inflammation, that fight infections, and that can help inhibit angiogenesis. Garlic is also a potent diaphoretic, expectorant, and anti-parasitic plant that was used as often a primary ingredient in many of Hippocrates pulses and treatments. One of my greatest memories from graduate school was a conversation with a Chinese physician who was in my nutrition program to earn her MPH. She shared with me that, in China, when a patient had an infection that would not respond to the normal antibiotic therapy, that routinely garlic extract was used with a relatively high rate of success. It made quite an impression on me and was a great reminder then and now how some of nature’s greatest gifts are so often overlooked. Both garlic and onions contain large amounts of fermentable fiber, so long as they are not over cooked (which breaks down all of this soluble fiber so much that our gut flora can no longer use it as a fuel source.) This is a major reason why so many people experience high levels of gas with large amounts of either. Of course, scallions, leeks, and shallots also contain these same attributes. When eaten raw, garlic has a very high antimicrobial/anti septic/antibiotic value and it is estimated that one clove of freshly crushed garlic has the antibiotic value of 100,000 units of penicillin. Once cooked however, this property and some others are lost. It will still help with lowering blood pressure and helping to clear arterial plaque, but not at an equivalent rate. Allicin is one of the primary phytonutrients in garlic and is the leading anti-inflammatory agent. Onions can be eaten in larger quantities than garlic (by most of us) and therefore can be a more important source of the highest quality dietary/fermentable fiber. The more stronger flavored varieties are better sources of other anti-inflammatory substances like quercitin, often concentrated in the outer-most layers of the onion. Therefore, while it is of course ok to discard the papery layer of your onions, do not discard too much of that vegetables outer layer as you will be losing much of its great nutritional value. Eat copious amounts of garlic and its relatives on any cleanse or detox program as they both help eliminate and detoxify harmful waste products throughout the body’s main compartments: circulatory, lymphatic, and digestive systems. Research has shown that this help with detoxification ranges from heavy metals to excess glycosylation residues, and from yeast overgrowth to staph infections. Those friends who complain too much about your breath or body odor, you probably need a break from anyway. Onions, garlics, leeks, and shallots are all members of the genus Allium. This vegetable was a staple in the prehistoric diet. Onions most likely originated in central Asia. Some research suggests onions were first grown in Iran and West Pakistan. The Egyptians buried onions along with their Pharaohs as onions were considered to be an object of worship and a symbol of eternity. Onions and leeks may be one of the earliest cultivated crops because they were were easy to grow, stored well, were easy to transport, and could be grown in a variety of soils and climates. In India as early as the sixth century B.C., Charaka Sanhita celebrates the onion as medicine a diuretic, good for digestion, the heart, the eyes, and the joints. The athletes for the Green Olympic Games consumed onions and leeks before competition, consuming pounds of onions and onion juice to build their strength and endurance. The Romans ate onions regularly and carried them on journeys. The three main vegetables of the Middle Ages, were beans, cabbage, and onions. In addition to serving as a food for both the poor and the wealthy, onions were used in treatment of headaches, snakebites, and hair loss. The Mayflower brought onions with them even though onions already grew throughout North America. Pilgrim recipes call for “good store of onions “. Native American Indians used wild onions, eating them raw or cooked, as a seasoning or as a vegetable. Garlic on the on the other hand, did not have a place in the kitchen of the Anglo- Americans. It was more likely found in the medicine cabinet to fumigate for disease as the garlic was consider too strong for cooking. The Spanish in the Southwest, the Pennsylvania Dutch, the French in Louisiana all used garlic in their kitchens daily. Wethersfield, Connecticut, began raising onions on a commercial basis in 1788 by the Wells Brother and exported onions all the East Coast to the West Indies. 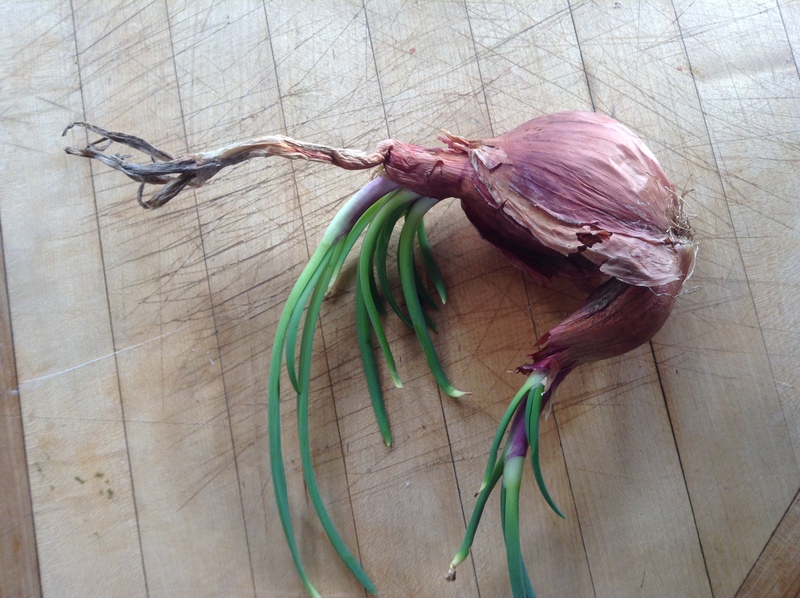 Not a great keeper but a lavender color onion with wonderful flavors! 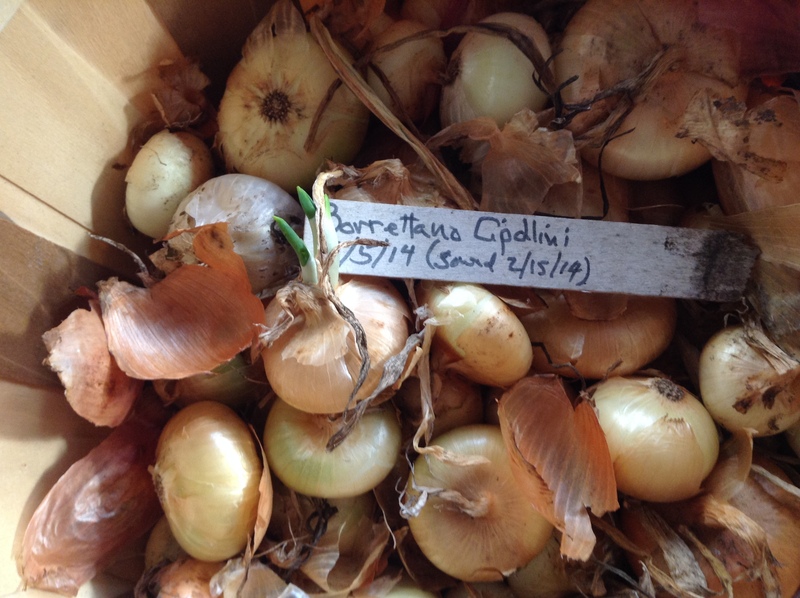 While onions are easy to grow, onions are sensitive to soil and climate conditions.There are hundreds of Heirloom varieties available, but if you are considering growing them, you will want to grow onions to your area. 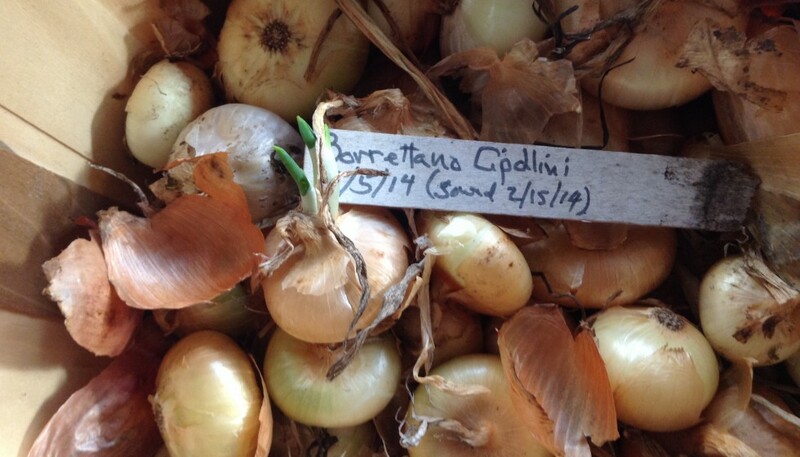 Heirloom varieties are mostly available as seed, not as onion sets. This is a two season process: Seeds get planted on May or June, then thinned and planted in the garden by mid-August or early September. These seedlings make sets that can be dug up, dried, and saved until spring, or overwintered in the ground and thinned the following year. Onions are the third most consumed fresh vegetable in the Unites States and available in grocery stores all year long. 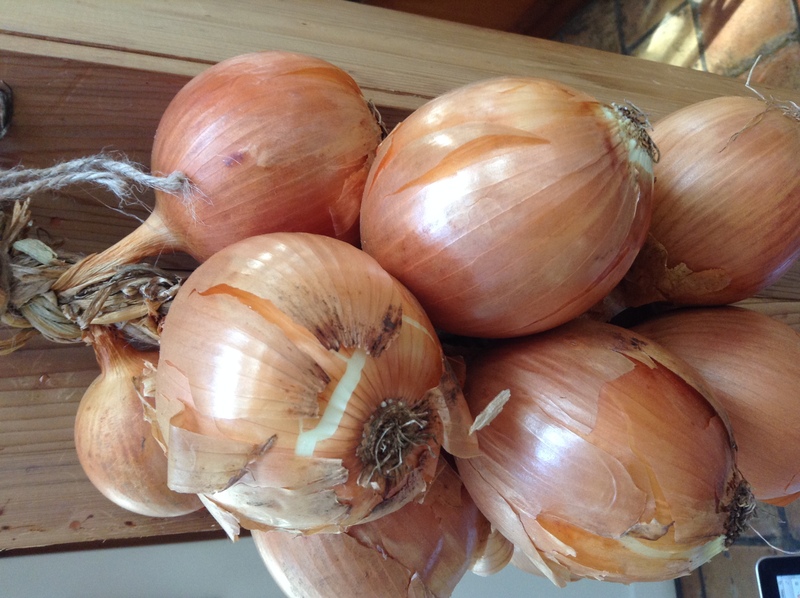 Onions should be stored in a cool, dry place with lots of air. Do not put them in the refrigerator or a plastic bag. What to do to get rid of onion breath? Chew on some parsley and then check your teeth for green pieces. Onions and garlic make everything taste good. Almost every dish or meal can be started with onions and garlic sautéing in a pan. So what to do with a pan of sautéed onions and garlic? *Add chopped kale or chard and sauté all together. *Add carrots and ginger and vegetable stock and cook for 25 minute- puree in the blender for soup. *Add broccoli and or cauliflower and ¼ cup of stock, place a lid on the pan and steam for 10 minutes. Mix the all the ingredients together and to sit for at least an hour before serving to let the flavors combine. Although most of the health properties that are referred to are cooked out of this recipe, it is still delicious and has great fiber. If you wanted a twist and wanted to add some of the health of the onion back into the soup. Chop raw onion place at the bottom of the bowl and ladle this hot soup over the chopped raw onions. Remember, the best food you can eat for the prostate is raw onion! Include it in your daily meals anyway you can! This makes a great topper to salad, to serve with endive leaves, over tofu or lentils. In a medium bowl, mix together mint, onion, parsley, oil, juice, and zest, and toss until evenly combined. Serve immediately over tofu, lentils or as a dip with endive.